The Kobe City Museum’s recent art exhibition celebrated the Japanese bird and flower paintings of Kakutei (1722-1785), the Nagasaki born Obaku monk and artist. As a consequence of the Tokugawa shogunate’s isolationist policies, Nagasaki was the only place in Japan where one could come in contact with foreign cultures and people. Kakutei’s fascination with Chinese culture began at an early age, leading him to study Nanpin paintings under Kumashiro Yuhi from the age of 14. By age 20, he became an Obaku monk at Shofukuji temple. Later in life he was ordained as the 6th head priest of the Obaku sects’ Manpukuji temple. At 25 years old, Kakutei relocated to Kyoto and Osaka, bringing with him a wave of Chinese Nanpin style bird and flower paintings. As an influential painter, Kakutei thrived in Kyoto and Osaka and also spent time in modern day Tokyo. Most of Kakutei’s surviving works are brushed with ink on paper—many focusing on The Four Gentlemen: plum blossoms, bamboo, chrysanthemums, and orchids. All four flower types have long been featured in Chinese literati painting to express dignity and purity. It is through these works that we can most strongly feel Kakutei’s admiration for Chinese culture. Though his early works clearly show his talent with the brush, his later ink compositions are braver and fuller, spilling over the canvas with unexpected twists and turns. His bravura and freedom of expression bring a great sense of vitality to these later works. 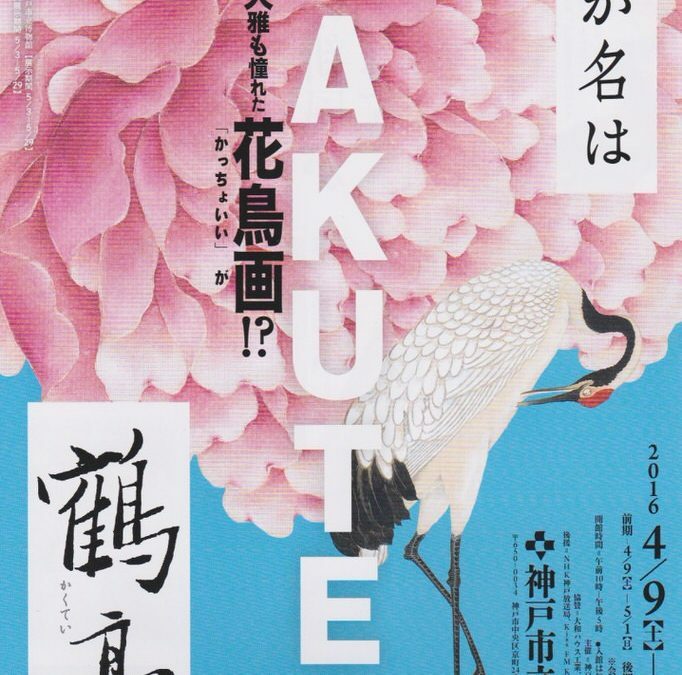 Though not as well known, Kakutei also produced full-colour bird and flower paintings on silk. These paintings are notable for their vibrant colours and the sense of movement created by the subjects. Improvements in his technical virtuosity in this form can also be traced somewhat linearly through his career, perhaps highlighted by the exquisite brushwork of the pink peony that appears on the exhibition flyer. This bird and flower painting is compared directly to an earlier work featuring a phoenix and paulownia, with its skilful brushwork, gorgeous colouring, and creativity all clearly displayed though the composition itself is quite clumsy. In contrast to Shen Nanpin and his student Yuhi, Kakutei’s colour compositions place greater focus on the foreground’s immediacy. Ink-washed backgrounds and rounded rocks give way to flatter forms and minimalist compositions. Kakutei simplified the brushwork on the trees and rocks, enhancing the dramatic contrast between the vivid colours of the birds and foliage. As the works of Ito Jakuchu and Soga Shohaku influenced Kakutei’s paintings, a few of their works were included in the exhibition. Regardless that Kakutei was a talented and highly influential painter, his skills do not quite approach those of these two masters.